We offer several different methods of shipping, some of which are dependent on where you live. For the majority of states, we recommend going with 2nd Day Air shipping; it is the most cost-efficient, and our specially designed boxes are capable of going 3 full days without external refrigeration. 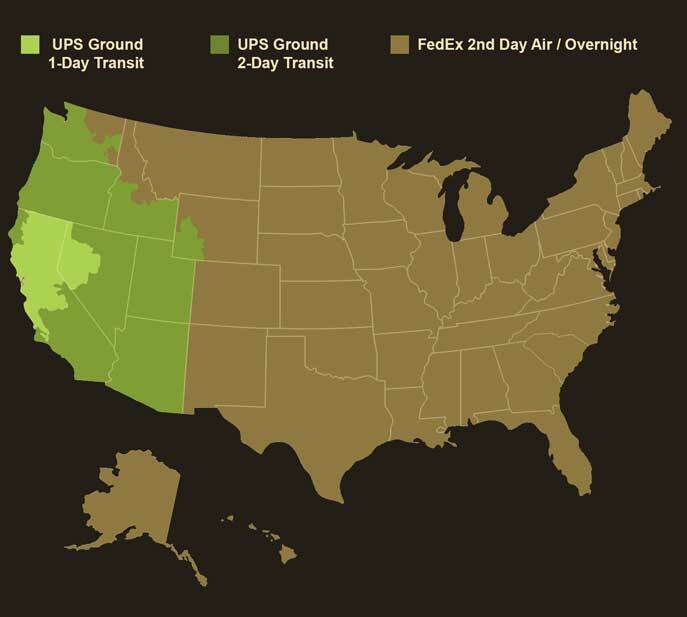 For those of you on the West Coast, we can ship via UPS Ground for the most cost efficient method. We strongly suggest that you plan to have your steaks arrive at least one full day before you plan on cooking. Becuase shipping complications are often out of our control, we've found it is safest to have a day of "buffer" between arrival and your planned usage date. Our baseline is to send all packages designated as "no signature required" – this allows the package to be delivered without you having to sit at home all day. If you prefer your order to go as 'signature required', just drop us a note in the comments section during checkout and we’ll make sure to accommodate. We offer UPS Ground shipping to all locations that are within 2 transit days of our facility as our most cost effective shipping method. We include ample frozen ice packs in our boxes to ensure that the product gets to you in perfect condition. If weather is particularly hot in your area, just add a note in the comments section during checkout that’d you like us to add extra ice and we’ll be happy to accommodate you. During the summer months (or during particularly hot spells), items that are shipped frozen may experience some surface thaw during transit. You don’t have to worry about throwing these in your freezer for later use, or they can be kept in the fridge for 3-4 days. Our preferred method of shipping, FedEx 2nd day will deliver a package in 2 business days. Less expensive than Standard Overnight, it also gives some wiggle room in the rare case that a package encounters problems en route. Standard Overnight ensures that a box will spend 1 day in transit, and will arrive at your location before 5pm. Priority Overnight ensures that a package arrives before 10:30am (unless shipping to a rural address, in which case the package arrives before 4:30pm).